For coppicing read tree-felling. As we quickly learned, Wandlebury has had only limited woodland management in recent decades so that rather than help with the annual coppicing cycle, our group of volunteers was really working on a section of neglected woodland to re-establish a regular cycle of coppicing. To start with this meant felling self-seeded trees, mostly ash that were crowding each other for light; growing tall and spindly, with little foliage useful for wildlife. Once the wood was opened up a little, it then meant coppicing lime stools that had been left untouched for twenty to twenty-five years. Inevitably this meant some of the tree trunks were substantial – perhaps six to eight inches in diameter – requiring considerable care to fell when working as part of a large group. Also a lot of effort, since understandably we volunteers were not let loose with chain-saws. Only Glenn, the estate manager, had a chain saw, which he used to tidy up behind us – making stumps lower and cleaner or cutting through trucks that defeated our meagre hand-tools. We relied mainly on bow saws, with loppers and pruning saws to help when cutting and stacking the felled trees. There was something strangely primeval about working in a group to fell dozens of trees with just a few hand tools. But we weren’t early agriculturalists clearing virgin forest to build a settlement or start growing crops or grazing livestock. Instead, our aim was to rejuvenate the wood by letting in more light to encourage greater bio-diversity and more vigorous growth at ground level. This in turn would provide the shelter needed for a range of plants, animals and birds to re-colonise the woods. So how do you fell a tree? Well, not with an axe in our case, though I’m sure it must still work. We used bow saws (sort of large hack saws with no handle) and started by deciding where we wanted the tree to fall (away from people, obviously, but ideally also away from other trees that might impede the fall and leave it awkwardly suspended). We also looked for any dead wood or broken branches that could fall as we worked and tried to dislodge them safely. Then we cut a wedge (or ‘gob piece’) out of the tree on the side where we intended it would fall. This meant cutting diagonally into the trunk and then making a second cut, horizontally, to intersect with the base of the first. Having removed the resulting wedge – which looked something like an Edam slice – it was now just a question of sawing through the trunk from the other side, aiming to meet the base of the wedge-cut on the other side. With our bendy-bladed bow saws this was easier said than done, but there always seemed to be enough margin of error to bring the tree down, one way or another. Lone trees were easy – they were mostly spindly specimens with little healthy top growth and came down with few problems. Once down we chopped them into roughly four foot sections and stacked them for the Trust to in various woodland crafts or as firewood. But tackling a mature coppice stool was a completely different business. With help from Glenn, Jane and others I managed to coppice one Lime tree stool in about two hours. Left for twenty to thirty years, it consisted of five main trunks and considerably more thin ones, often packed tightly around the main stems. Here it proved much harder to use the bow saw effectively since there was always another truck in the way to prevent a clean cut. But by thinking hard about the order to fell, and with the help of the little pruning saw, it was possible to work slowly through the whole stool. With a chain saw (and the right training) the job would have taken no more than a few minutes, but there was something strangely satisfying about using tools only marginally improved on those available to Iron Age man. By three, I was definitely running out of steam. With the two thickest trunks still defiant, I willingly accepted Glenn’s help. In an instant he had done 4/5ths of the work on each tree, thoughtfully leaving me with the satisfaction of completing the stool without the danger that he or anyone else might miss the England/France clash at Twickenham. 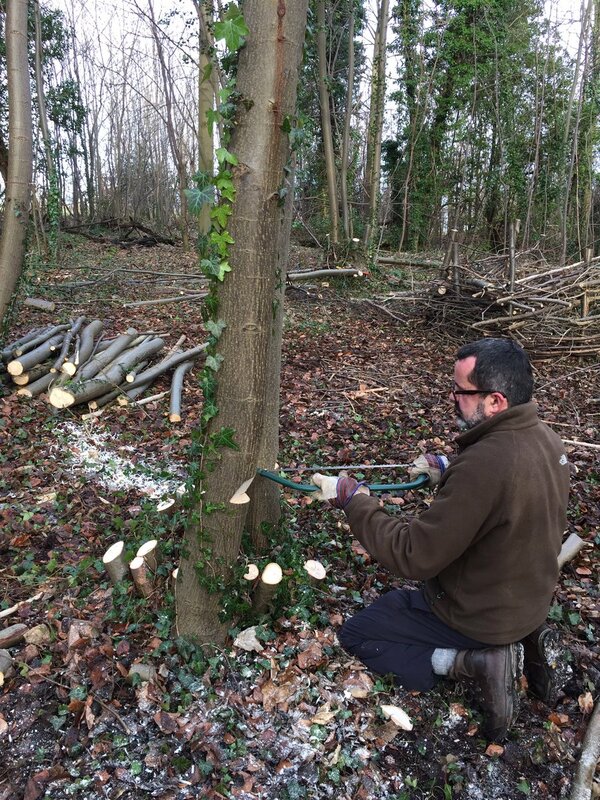 With the trees down Glenn tidied everything up in seconds – ensuring that each stump was sloped gently away from the centre of the stool, so that rain would run away from the tree rather than risk rotting its core. Usually the stumps are then covered in brush, or staked with impromptu fences made from felled timbers, but this stool was to be left unprotected as an experiment. Just how much damage will rabbits, muntjac and fallow deer inflict on the tree’s young fresh growth later in the year? It will be an experiment I will watch as keenly as Glenn and his colleagues over the months to come.